The rubric of the prologue to the main text describes this book as 'The book of things to be remembered about the conventual church of Barnwell'. It is a collection of material relating to the history and organisation of the Augustinian priory of St. Giles, Barnwell, on the outskirts of Cambridge. 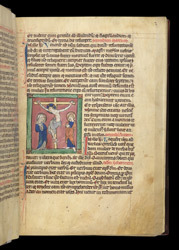 In the midst of the text of a mass of the Holy Cross is a depiction the Crucifixion, the only miniature in the volume.